Author Kevin Christofora’s Hometown All-Stars series teach children important life lessons while encouraging them to engage in active outdoor play. Kevin Christofora’s children’s baseball book, ‘The Hometown All Stars,’ encourages children to play outdoors through an engaging bedtime story about America’s most beloved sport. Baseball is both a beautiful and fun sport that can provide children with so many benefits; I hope to create dedicated new fans of America’s pastime through my books. With baseball season in full swing, many fans are already turning their eyes to autumn, when play-offs and the World Series will dominate the sports world. Fans desire nothing more than to see their favorite team take the lead in its division and eventually advance to the final series. For children, especially those who are too young to really understand what all the fuss is about, however, the autumnal baseball frenzy offers more confusion than excitement. Luckily, author Kevin Christofora aims to educate young fans about the sport with his series of children’s baseball books, providing a great way for children to engage with and enjoy the World Series. 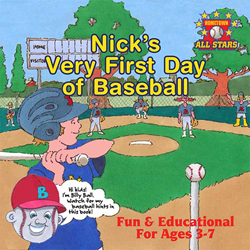 The Hometown All-Stars series, which includes Nick’s Very First Day of Baseball and Magic Bat Day, is a fantastic way to teach young children the rules of the game—as well as basic fitness, sportsmanship, and even life lessons. Christofora covers everything from the importance of nutritious snacks to the reason why young players must wait their turn to bat, in a manner that is fun and interactive. His prose can challenge beginning readers to learn new words, while older children can really begin to absorb the rules of the game. Finally, the books enable children to truly engage with and enjoy the sport of baseball. He has appeared on ESPN Radio, 660 News Radio, Santa Fe - KVSF 101.5, and WDST-FM Woodstock, and has had articles featured in About Families Online, KidzEdge, Mom Blog Society, and several other publications.